FM radio projects that use chipsets with a low-level Inter-Integrated Circuit (I2C) interface, like the RDA5807M and TEA5767, can work, but I found that both solutions have some drawbacks. The RDA5807M chip is poorly documented, with only Arduino C libraries, and the TEA5767 chip has no volume control. Software-defined radio (SDR) offers a higher level interface that allows access to mixers, filters, amplifiers, modulators/demodulators, and detectors on the hardware. A wide range of hardware supports SDR, and the RTL-SDR  USB dongles based on the RTL2832U chipsets are well-priced at $10-$15. SDRs have a large list of supported applications; some of the cooler projects include tracking airplanes, free-to-air TV, and monitoring satellite data. For my tests, I used a basic Raspberry Pi 1 Model B, but I also tested it on the Rasp Pi versions 2 and 3 and on an old, low-end PC running Lubuntu. An important difference between the RTL-SDR dongle and an FM tuner module is that the FM tuner module needs the speakers to be directly connected to the tuner module. When you are using the RTL-SDR dongle, the audio is generated on the Raspberry Pi (or PC), so you will use the sound output of your computer. 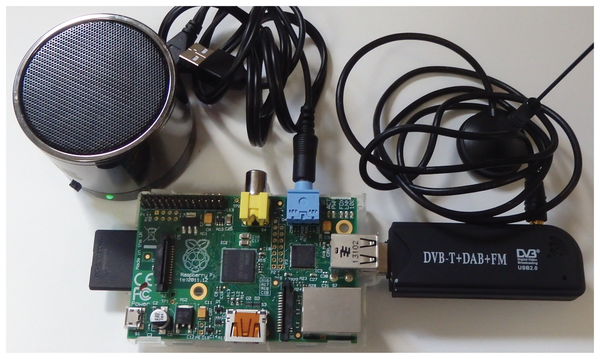 For my Raspberry PI setup, I used powered speakers (Figure 1), and for my laptop testing I used the internal speakers in the laptop. Figure 1: FM radio hardware setup. The RTL-SDR dongle includes an externally connected antenna; if possible, you should try to place this antenna close to a window. The rtl_fm command-line utility is an FM demodulator that is used to read and sample a selected frequency. If you are looking to do more serious applications, see the GNU Radio Project . A number of options can be passed to rtl_fm; the key ones are the frequency (-f), the sample rate (-s), and the output rate (-r). The output of rtl_fm needs to be directed to an audio player program. I used aplay, which is a command-line Advanced Linux Sound Architecture (ALSA) player, but other players could be used. I matched the sample rate (-r) for aplay with the rtl_fm output sampling rate and used the 16-bit little-endian (S16_LE) aplay sample format (-f). For Raspberry Pi applications, you can force the audio connections to use either the HDMI port or the phone jack on the Pi in raspi-config by selecting the Advanced menu option and then Audio (Figure 2). Figure 2: raspi-config Advanced | Audio option. For my basic testing, I created a simple Python command-line application that I could run on both my Raspberry Pi and on my old laptop running Lubuntu (Figure 3). 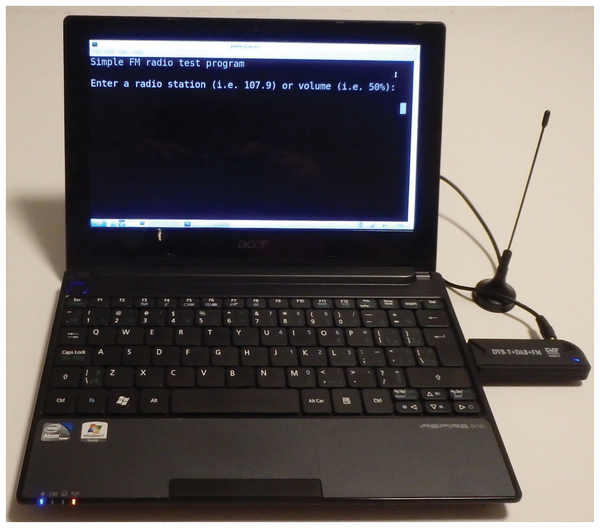 Figure 3: RTL-SDR dongle on a Lubuntu laptop. A few Python libraries were used, including the subprocess library to launch rtl_fm and return a process ID, the os library to kill a process, and the time library to add a delay (sleep), so the rtl_fm task was given enough time to shut down cleanly before restarting. A newstation() function was created to stop a running rtl_fm FM station and then restart it with a new FM station frequency, and a setvolume() function was created to pass new volume settings to amixer. which then accepts a volume level as a percentage (e.g., 50%) or a radio station frequency (e.g., 107.9). FSFE and FFII to Radio Station Winners: "rOGG on"
Radio Free Deutschland: For Document Freedom Day, March 31 2010, a couple of European radio stations were granted awards for using open standards. FM no longer has the biggest selection of radio stations. Instead, you need an Internet connection. But how can you save a copy of your favorite web broadcast?